About thirty years ago I invented a comic strip, “Grim Fairy Tales” published in the ‘zine ‘Casual Casual’, and distributed at the Cameron House, a tavern on Queen St. West, a popular Art-bar at the time, which included a stage for music and theatre. The comic strips were modernized versions of the classics tales. (RumpleZitskin; ‘Goldilox and the Three Bores’; The Fish Wish, etc.). In the summer of 1988, Shadowland Theatre on Toronto Island produced three of the strips as a Musical, with funds from Canada Council. I designed the sets and costumes, dialogue and choice of music. I re-wrote them up as an illustrated book…’Grim Fairy Tales, 12 Modern Fables’ in 2009. Now…. I would like to take my favourite character from this Grim collection and make her into a blog. 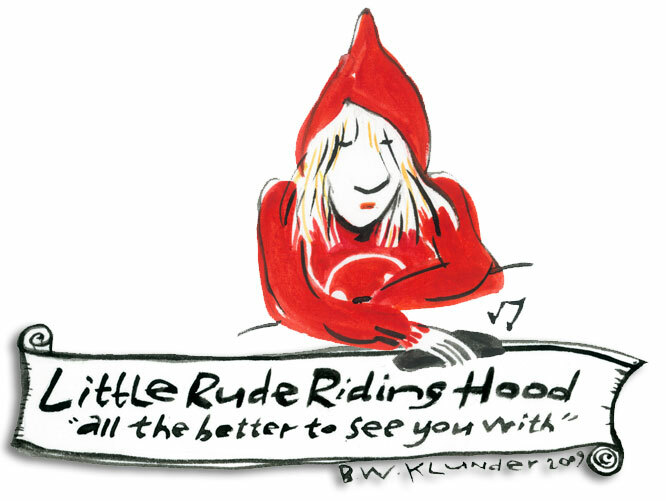 ‘Little Rude Riding Hood’ has lots to say, mostly to her Gran on her cell phone. After saving her Gran’s life from the dangerous Wolfgang with her foul mouth, Little Rude goes on to have many opinions about the general confusion and stupidity she sees around her.